If you are a cat owner, you have probably experienced times when you thought, "now where is that cat?" There are a lot of normal, healthy reasons that cats may find a hiding spot. Some of these reasons include curiosity, comfort, or even boredom. Cats may also hide due to stress, age-related changes or illness. Cats may hide in some specific spots because of the temperature. They may seek out spots near air vents to benefit from a warm or cool breeze. They may curl up in the sink or bathtub to cool off, or worm their way under a pillow or blanket to warm up. 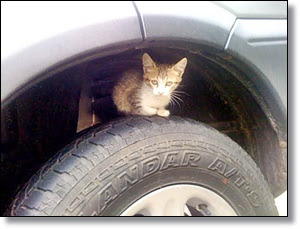 A parked car is just one of many hazardous hiding places for cats. If your car's parked outdoors in cold weather, please bang on your hood and honk your horn to rouse a possibly sleeping feline and give him/her a chance to crawl out before you start your engine. Dishwasher - Always look for Kitty before starting the machine. 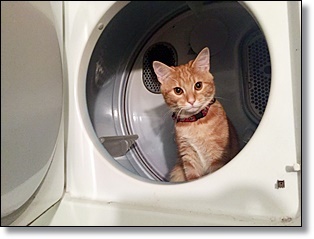 Washer-dryer - Don't leave the door open when not in use; always check inside before starting a cycle. Wood stove - Light the kindling and shut the door only AFTER doing a thorough check. Reclining sofa or chair - Believe it or not, this is a prime small-animal hiding spot, so check under the seat and evict the previous occupant before you recline, to prevent injury. Cardboard delivery boxes - Cats are notorious box nesters, so take care not to throw Kitty out with the recycling. Workers' tool boxes (electrician, handy man, etc) - Cats see these as fun new hiding places worth investigating. Luggage or gym bags - Close these when not in use, to prevent pet hair buildup as well as an accidental departure. 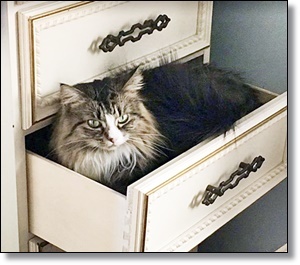 Dresser drawers - These should remain shut so they don't turn into kitty traps.